White or colored decorative top coat in paste form; ready for use. It is easily applied on properly prepared and sound surfaces, on floors and walls. Suitable for wall applications and special projects such as countertops and sinks, showers, built-in furniture and wood furniture, tables, doors etc. The product has the ability to color over any existing pressed cement screed. It is also unique for its ability to be used for any surface repair over deteriorated or damaged pressed cement screeds. The product is an exceptional solution for everyone that wants to renovate and decorate their residential or commercial space. The product can be colored and styled through the DUROCOLOR system in 120 selected colors, with the ability to mix them with each other, creating more options. Classified SR-B2,0-AR0,5-IR1,7 as floor screed material, per EN 13813. 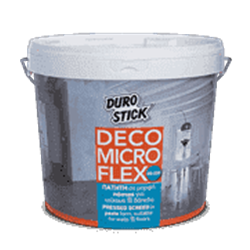 * For floor application, it is essential to add DS-258 DECO MICRO FLEX HARDENER into the paste in order to increase both abrasion and scratch resistance. 0.6-0.7kg/m² per coat, depending on the surface.